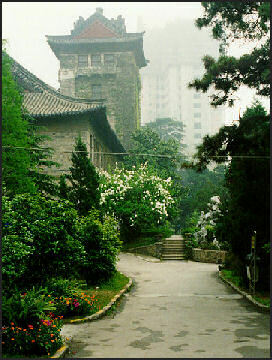 Nanjing University As of 2000, there were 1,841 institutions of higher learning. These include universities and four-year non-vocational colleges. Between 1997 and 2000, 68 new private universities and colleges opened. 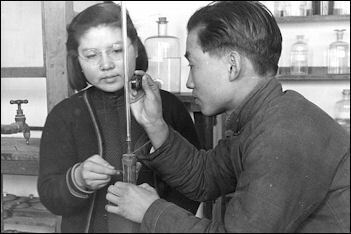 Most Chinese universities were set up in accordance with the Soviet model to produce individuals that serve the state. Tuition was paid for by the state. The state also assigned majors and decided the jobs the students would receive after they graduated. Students mostly took classes only in their field and in Communist ideology. The system produced lots of engineers. According to the 2010 census, the proportion of college-educated Chinese went up from 3.61 percent in 2000 to 8.93 percent. In 1998, when Jiang Zemin, then the president, announced plans to bolster higher education, Chinese universities and colleges produced 830,000 graduates a year. In May 2010, that number was more than six million and rising. Still, for the average Chinese family a university education is impossibly expensive. More and more Chinese universities are switching towards the Western model of a liberal arts education. In the early 2000s, Beijing University began requiring students to take basic courses from five varied fields in their first year and select a major and begin specializing in their second year. In a 2010 ranking of universities by the Times Higher Education Magazine, China had six universities in the top 200, more than Japan which had five, and the highest ranking in Asia. Peking University was the highest ranked Chinese university, placing 37th overall. In the 1990s, the Chinese government began pouring a lot of money into Chinese universities in an effort to bring them up to world class status and create enough openings for a boom in university age students. Schools were merged, new facilities and dormitories were built. And in process some of the money disappeared into the vacuum of development and construction corruption.These days land is still being cleared to make way for new school facilities. China now has more than 1,900 institutions of higher learning, nearly double the number in 2000. Close to 19 million students are enrolled, a sixfold jump in one decade. The number of faculty has more than quadrupled. The number of students enrolled in Chinese universities increased twentyfold in the last 30 years: between roughly 30,000 in 1978, when universities opened again after the learning-free zone of the Cultural Revolution, and 600,000 in 2009. Between 2000 and 2009 higher-education enrollment more than tripled. Today, China awards more college degrees than the United States and India combined. Annual awards of doctoral degrees rose sevenfold between 1996 and 2006. Since China began opening up in the 1980s a number of private, profit-making universities have opened up. Most of the students are young people who failed to get into established universities. The universities often charge high fees and deliver a education of dubious quality. In a speech on education former premier Zhu, Rongji said in 2011: "I don't advocate for building up so many universities. To do what? When I entered Tsinghua in 1947, there were only 2,000 students. Now the number is in the tens of thousands. It is OK for Tsinghua to have tens of thousands of students. But now even Jilin University has 75,000 students. There are now a lot of academic frauds, even professors fabricate, plagiarize from papers by others. What would happen it this continues? ... You'd better concentrate efforts to do a good job in promoting compulsory education." China is establishing world class universities and research centers. Top universities in China tend to cater to the elite and favor student in their homes cities, often requiring rural students to outperform urban counterparts on entrance exams to get in. A degree at a top university is regarded as a ticket to a better life. 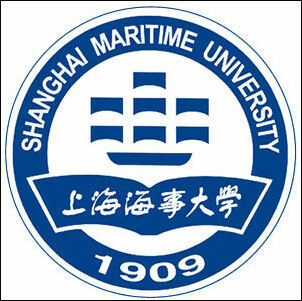 Top universities include Beijing University and Qinghua University in Beijing and Fudan University and Jiao Ting University in Shanghai and the University of Hong Kong. Qinghua is China's leading technical university. It is regarded as China’s MIT. Beijing Normal University is another top Beijing university. In the U.S. News and World Report ranking of universities in Asia the University of Hong Kong ranked third, Peking University was 8th and Tsinghua University was 10th. In the Quacquarelli Symonds ranking of universities in Asia the University of Hong Kong was first, the Chinese University of Hong Kong was second. Beijing University is known in China as Beijing Daxue, or Beida for short. It was established and run by Americans in 1889 and was located near the Forbidden City in Jingshan Park until it was moved to its present location in the far northwest part of the city in 1953. Its students were at the forefront of the Cultural Revolution and the Tiananmen Square demonstrations. Beida is underfunded and short on supplies. Sometimes students have to take exams standing up because there are not enough chairs. Many students share a four-square-meter dormitory room with five others. 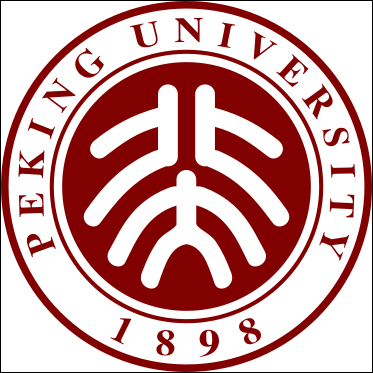 Peking University has a similar standing to Oxford or Cambridge but, unlike those institutions, has a reformist reputation: its students played a crucial role in the 4 May movement of 1919 and the 1989 pro-democracy Tiananmen Square demonstrations. Tsinghua and Peking Universities now top the world in PhDs obtained from U.S. universities. Third tier universities are mostly private ones that are expensive but easy to get into. Harbin Engineering University University education traditionally has been free with students being given a stipend, which was sometimes increased with good grades. Training is highly specialized from the start. Students often spend five or six years studying their subjects and take only courses in their fields. Future doctors take only medical classes and future lawyers take only law classes. Until recently there was no such thing as a liberal arts curriculum. The Communist system traditionally dictated what classes university students would take and decided what jobs they would take after they graduated. The system encouraged students to go into pure and applied sciences, engineering, medicine and agriculture. About 50 percent of all students majored in engineering with hopes of getting a prestigious, well-rewarded job in a large state institution. The best and the brightest were often picked for scientific jobs with military applications. The number of slots open in universities was determined by five-year plans which took into consideration the needs of certain regions and the number of doctors, engineers and scientists the government decided country needed. The children of tradesmen and landowners from generations back were sometimes punished for their pedigree and had a harder time getting into good universities that those from peasant stock. 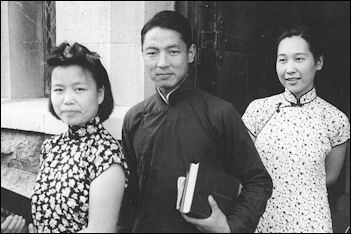 After the Cultural Revolution ended a students began flowing back to the universities many of the best and brightest majored in literature and philosophy. These days they are more likely to be pursuing MBAs. 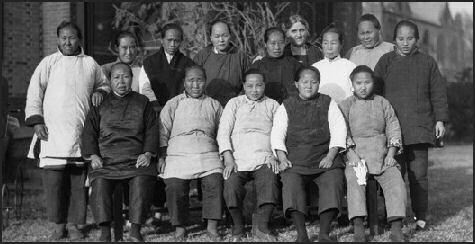 University students in the 1920s There are over 24 million university and advanced vocational students in China, or roughly about 20 percent of the college-age population (2006). The number of students entering university and college increased by more than 500 percent from 4.8 million in 1998. The majority are concentrating in science and engineering. Chinese universities produced 23,500 PhDs in 2005, 70 percent of them in science and engineering. Twice as many 18- to- 24-year-olds are enrolled in colleges in the late 2000s were enrolled a decade earlier. Only 11 percent of university-freshmen-aged young people enter university compared to 64 percent in the United States. These days about a quarter of all Chinese in their 20s have attended some university. The increase in the number of university students is the result of a government policy in the late 1990s to reduce unemployment by doubling the number of college and university students. Only 15 percent of college-age youth get an education beyond high school. Most are urban. Only a third of China's university students are female. Rules have changed in recent years that allow older people to attend college. In 2006, the government decided there were too many university students, saying the high numbers had resulted in overcrowded campuses, overworked professors and graduates who were unable to get decent jobs. To reduce the number of university students the government decided to raise the value of vocational training and high school diplomas, making a university education seem like less of a necessity. An effort was made to police universities to make sure they didn’t admit low quality students to make money. Attempts in the past to reduce the number of students have largely been ineffective. 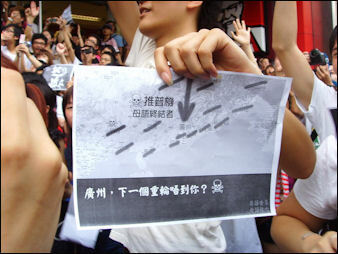 student protest in Guangzhou in 2010 Beida has a long tradition of activism. It was founded by Cai Yuanpei, an educator and revolutionary. Its students were among the first Red Guards in the Cultural Revolution and were leaders of the 1970 Democracy Wall. The Tiananmen Square demonstrations were started by Beida students fed up with conditions in their dormitories and their country. One student said, "You can't get things done without money. The government won’t allow us to speak out, so we'll engage in business, we'll publish, we'll go overseas." Another student said, "Student's are studying like mad. After school, they study a law, business, foreign language---even driving. They know it’s a tough world out there, and it's not enough to get a Beida bachelor's degree." University students that show too keen an interest in reformist politics risk being discriminated against. Professors that criticize the government are either fired or kept on the faculty but are barred from teaching. "University party organs must adopt firmer and stronger measures to maintain harmony and stability in universities. Daily management of the institutions should be stepped up to create a good atmosphere for the success of the party's 18th congress," Xi said yesterday in Beijing at a gathering of Communist Party representatives from universities. The party, unnerved by a series of riots, demonstrations and strikes caused by land seizures, pollution and labour disputes, is stepping up control on different fronts - such as in propaganda, media and social controls - to minimise political risks ahead of the congress. The revolutions in the Middle East last year, along with online postings calling for similar ones in China, have also put the party on high alert. Universities have long been regarded as the most important stronghold for the party's grip on ideology. Liu Yandong , the highest-ranking woman in the party and in charge of education, said a series of plans had been made - including holding university presidents responsible for political missions, enhancing the capability of leaders in managing universities, and having active and strong party influence at the grass-roots level - to ensure the smooth opening of the congress. Xi also emphasised the importance of keeping an eye on lecturers, especially young ones. "Young teachers have many interactions with students and cast significant influence on them," Xi said, adding that their political opinions and moral standards "have a very strong influence on students. They also play a very important role in the spread of ideas". Xi said universities must make it a paramount task to "instruct" the thoughts of young lecturers and recruit more of them to join the party. When a student passes a university exam, his or her family is excited. On average, families spend $1,200 on parties, entertainment and supplies and nice clothes. One young woman told Reuters, "My parents were so happy my mother couldn't sleep for days." Her father hosted a party for 20 relatives at an expensive restaurant. University education was free in the Mao era. Free education on the university level was abolished in 1997 and fees increase at a rate of about 20 percent a year. Strapped for cash, universities now require students and their families to foot much of the bill for their education. Many families have difficulty coming up with the $1,000 or so needed to cover a year in a Chinese university. Rural families, with an annual income of less than $400, borrow money from relatives and save costs by doing thing like postponing medical care they need and eating less food. Students save money by not going home and borrowing rather than buying books. China produces a higher ratio of science to humanities majors than almost any other nation. Non-science classes are concentered in politics and foreign languages. The curriculum largely ignores China’s centuries-old tradition of teaching morality and philosophical thought. The result are graduates that are well trained but often dismiss the human and moral side of issues. A typical graduate becomes a technocrat who supports grandiose engineering projects because they represent progress but don’t think deeply about the point of what they are doing. Students usually listen to lectures. Discussions and seminars are rare, and in many cases discouraged. On subjects that deal with Communist ideology students are taught to memorize and authenticate what they learn not question, analyze, contemplate or investigate it. Exams that regurgitate learned material are often all that matters. Critical thinking and course work often count for little. University students are required to take classes on Marxist theory. In recent years students have complained how out of step the Marxism courses are with the reality of modern China. Some universities use the time to teach Confucian values instead. Software engineering schools have been established in 35 universities in China. Some Chinese professors spend a lot of time with students outside class time. They are more informal then and often have close relations with their students. Other Chinese professors don't even show up for their lectures because of off-campus business interests. Foreigners who gets jobs at Chinese universities complain they are often forced to teach twice as many hours as their Chinese counterparts. One Japanese student who took a course at Beijing University that compared political systems told the Yomiuri Shimbun that the lecturer criticized the democratic system over and over and often ended the lecture by criticizing the United States and concluding that the Communist Party knows what is best for China. The student said a typical assignment was summarizing a 600 page book in about disarmament in two weeks. Classrooms are not heated or air conditioned. In the winter students show up in their winter coats, scarves and gloves. Sometimes their ears and noses turn red and you can see their breath. Describing his English literature class at Fuling Teachers College, Peter Hessler wrote in the New Yorker, "There were forty-five students to a class, all of them close together behind old wooden desks. Maintaining the room was their responsibility. They washed the blackboards between classes, and twice a week they cleaned the floor and windows. If the cleaning wasn't adequate, the class was fined." "Students were fined for missing morning exercises, for skipping classes, for failing examinations, for returning late to their dormitories at night. Very few of them had money to spend in this way, so the class rooms were thoroughly cleaned." "My students were never wary of impossible tasks. They would work at anything without complaint, probably because they knew that even the most difficult assignment was preferable to wading knee-deep in muck behind a water buffalo." University dormitory room Most students live at home and commute to classes or live in crowded dormitories. A typical dormitory room has four or six students. Students find it difficult to study there and often go to the library at 5:00am to 6:00pm to secure seats. Many university blast the national anthem at 7:00am on public address sytems and require students to be out of their dormitories by 8:00am. The doors are locked and not reopened until 11:00am. Lights are turned off at 11:00pm. Students used to perform military service and help with harvests. In recent years mandatory military training and manual farm labor requirements have been eased. These days they go to peasant villages for 10 days and watch. Chinese students tend to study harder and party less than their American and British counterparts. Some engage in heavy drinking but not nearly to the degree and frequency found in American universities. In their free time students read newspapers and magazines, surf the Internet in the campus computer lab, play ping pong and tennis. They usually don’t have the money to do much than that. On their vacations they return home and watch pirated DVDs of Hollywood films. Students tend to live off of cup of noodles they buy at convenience stores and cheap meals they buy at university canteens or small restaurants near campus. Many have been spoiled by their families growing and have no idea how to cook or do housework. At some university universities so many parents accompany their children to their first day of school as freshman that mats are set up on the gym floor for them to sleep on. returning from military training Chinese universities have poor facilities: dormitory rooms that sleep eight, teaching materials bound by hand on reproduced on mimeograph machines, libraries with out-of-date books, overcrowded classrooms, professors earning less than cab drivers and textbooks that tow the party line. Many of China's universities were damaged and weakened during the Cultural Revolution. Critics say the quality of teaching has suffered, in recent years, as universities have become more politicized and Communist Party officials have begub to view a senior academic position as a ticket to career success. Many Chinese students have gotten into U.S. universities with fake diplomas and exams and essay written by persons other than themselves. In some cases the fake diplomas are used get study visas so the person holding them can work. In Shenzhen or Beijing you can buy a bogus bachelor's degree, a fake student ID or phony transcripts for a Chinese or foreign university for less than $100. 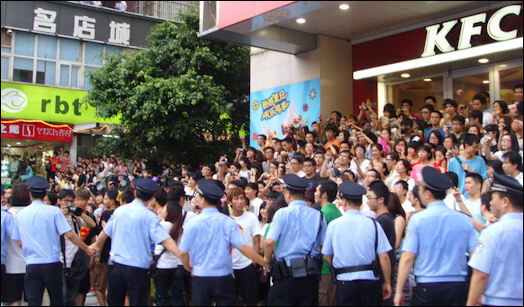 In June 2006, university students in Zhengzhou, the capital of Henan Province, smashed offices and set fires in a riot triggered by administrative changes that meant they would graduate with less prestigious degrees. The students, who attended Shengda Economics, Trade and Management College, had been promised degree from Zhenghous University, which Shengda is affiliated, and then told they would not get that degree. . The Institute of Business Administration in the town of Toulon France was investigated for giving out hundreds of diplomas to Chinese students in return for bribes. Academic cheating is a problem in China. In Beijing, you can pay people to take GMAT, SAT or TOEFL exams, write essays and forge transcripts. The cost of having a ringer sit in on a law or accountant exam is $120-240, for an English-language United States university entrance exam, $240-480. People who take test are called gunmen. One translator who charges $600 a test and called himself the "GMAT King" said he had more work than he could handle. He told U.S. News and World Report, "I saw so many requests for gunmen on school bulletin boards that I thought it made sense for me to use my TOEFL skills for some extra bucks." Cheating has a long history. 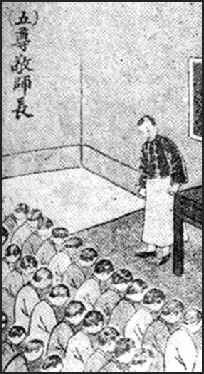 Scholars in the imperial era sometimes cheated on the civil service exams by writing down answers on a special shirt worn under their robes. There also many stories in Chinese literature of promising students wh failed on the test because they were corrupted by women and alcohol. Cheating on the college entrance exam is also a big problem. Many students use pagers and cell phones that have formulas and answers programmed in them. Some shops sell pagers with answers for that year’s exam programmed in. A videotape of a school in Hunan showed students passing around answer sheets and discussing test questions. Teachers in the room did nothing to stop them. There have also been reports of students giving their exams to teachers who answered the questions on the test and then fed the answers into pagers used by other students. In June 2004, at least seven high school teachers in Henan Province were arrested for selling exam answers to their students. The teachers used cell phone text message to send answers to students taking the university entrance exams. In the scam students and teacher used text messages and digital cameras to pass questions to other teachers outside the exam room. These teachers figured out the answers and text messaged the answers back to students who had paid them. A number of new universities have opened up. Among them is SIAS International University, founded by Southern California hotel entrepreneur Shawn Chen in Xinzheng in Henan Province. Since it was founded in 1998 with less than $2 million, it has grown from 250 students to 16,000 students, many of whom say the chose SIAS because of the American-style campus life, which includes clubs and cheerleaders. As of 2007 SIAS had 50 buildings, including a a Roman amphitheater, French and Italian restaurants, an administrative building with domed facade and a swimming stadium on 400 acres---twice the size of the campus of the University pf Southern California. Among is 700 member faculty are 100 foreign instructors, who are paid about $500 a month and receive free housing and plane tickets from their home country, mostly the United States.